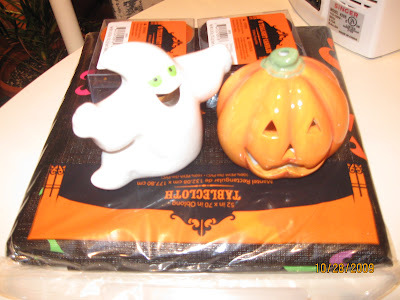 Days before the Halloween, I was surprised when Jeff bought more Halloween decors. He sometimes or seldom do this without me. But I am glad that he bough some. Because I am eager to add more Halloween Decors inside and outside the house. Aside from the pumpkin that we already bought. After I saw this items, I immediately light up the two candle holder and put one of each in the living room and one on the table in our dining room. Oh the tablecloth? Never used it, just save it for next year. ahh pang next year! after sa halloween ang mga decoration kay 50% off , pati chocolates..